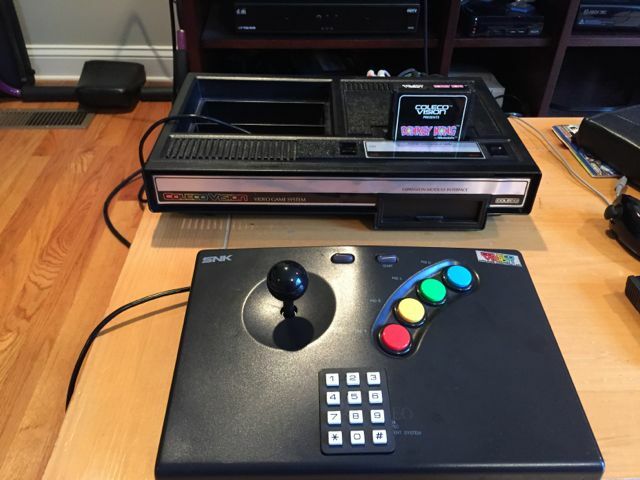 For the most part, you're asking for things the ColecoVision cannot technically do. Actually it is the Super Game Cartridge that allows that, not the Super Game Module. They are complementary, and you will see that SGC feature in action once we release Gradius, and of course with almost every single arcade port after that, as well as some adventure games. I am almost positive that the four Roller Controller firebuttons can be used at any time you want... even if you are using the Hand Controller(s) plugged into the R.C. ports. It's been a long time since I hooked up the R.C., so verification is needed. Speaking of the Roller Controller trakball, it makes a great mouse for the Adam, especially with PowerPaint by Digital Express. I wanted to chime in that I started in June 1st, 2013. I redrew the sprite graphic to CV Sprite 2 tool and then used ICVGM to draw the tileset. I have it programmed very little, having the character moving around and able to sprite. I have the 4 color Stanley sprite flicker between sprite 2-5 1 frame, and then 28-31 other frame. To ensure that Stanley is visible to the player at all time. The puffer object is limited to 3 at a time. I have the control to press up to jump up, and down to jump down(Have the pointer table for the jumping part. You could automatically slip off the edge to the lower platform, however the NES version does not allow that. At the time, I didn't know how to program it to debounce the side button so I could do rapid fire. So you can hold down the side button to have it fire continuely whenever the "cooldown" timer reach zero. There's only 2 puffers on screen at a time for the NES version. I have DK with sprite overlay for the face. One thing would be hard for me to figure out how to do enemy AI and their behavior. Do the game in screen mode 2 bitmap mode so having DK being behind the vines in the later level would be possible. DK big sprite once he fall off the vine would clear the enemies, spritesheet swap, and then fall down and Stanley would be doomed. Stanley victory dance animation would be swap in once he get DK into the beehive and fall down. This is missing in the NES version. I had to stop since it is a ton of work for me to do, I'm sorry. I do suffer depression and bipolar disorder stuff. Opcode can take the rein if he want to do the project. Kiwi, That looks fantastic! More than enough to show proof of concept. It can be done well. What is a Super Game Cartridge? I thought it just meant that it was an SGM game. Is there a four-way option? The Super Game Cartridge is more than that. It is an Opcode's exclusively and improved PCB, that's why we have features like saving highscores. Really, I'd be fine if a few colors were changed, mainly making the enemies two colors (as I've mentioned before, I don't mind flicker), and, to match the arcade colors making Mario's hat blue and Luigi's shirt black. The only other things would be an increase in difficulty and icicles on later levels. I'd personally rather see first a SGM version of Donkey Kong Jr. before DK3. If it looked as good as Donkey Kong it'd be an amazing game!